I designed, built, and populated an SEO friendly WooCommerce site. 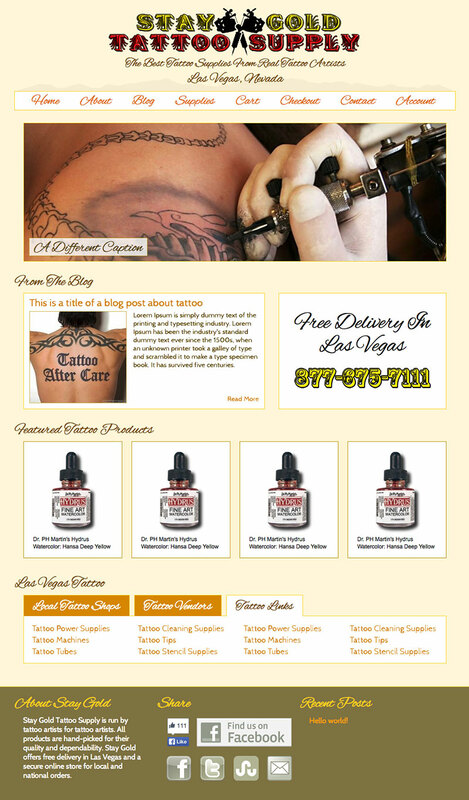 Stay Gold Tattoo Supply approached me needing an e-Commerce site. They offered little instruction which left me to make nearly every choice involved in the creation of the site. Utilizing a few graphics provided, I designed the site, giving it a desert theme appropriate to the Las Vegas location. I set up and configured WooCommerce. I created feature promos, sidebar promos, and all other site graphics. In addition, I did all the image processing and data entry and wrote SEO meta-descriptions for all the pages. Full service. Unfortunately, not soon after launch the business had to move and the site was scrapped, to my great disappointment.